can you stand some not so pretty "progress" pics? I'm sure some of you were wondering if and when this would happen... well, it has. 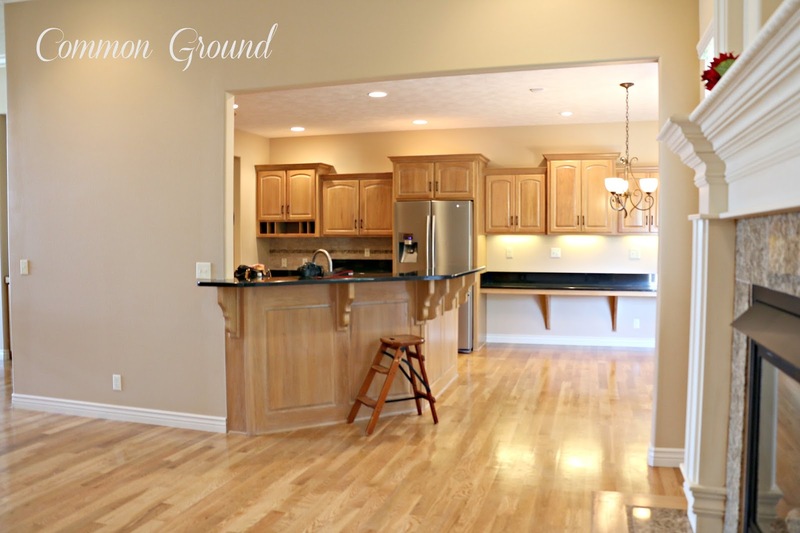 When we first looked at the new house, I knew the kitchen and adjacent kitchen/dining area would require some updating. We removed the line of cabinets and the study counter first thing, but I still was putting off the decision about what to do with the kitchen cabinets and large bar peninsula that dominated the space. I tried a whitewash technique last week with semigloss latex that actually worked pretty well. 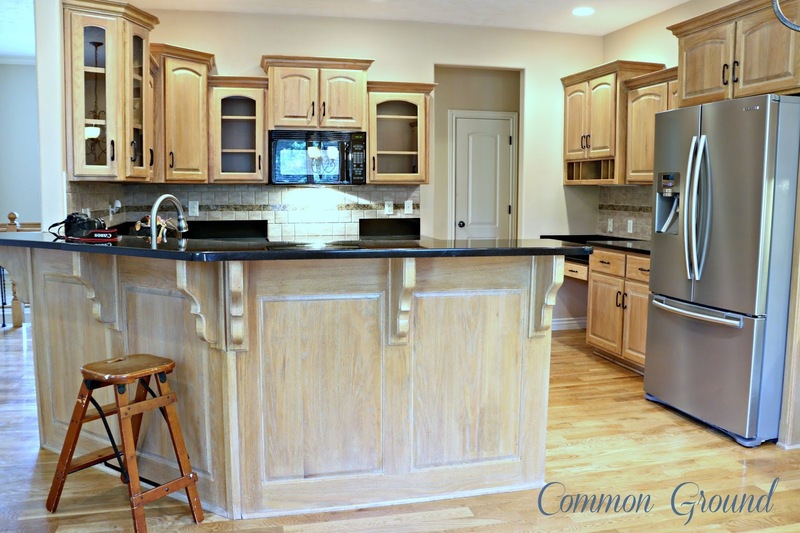 The cabinets looked aged and somewhat more "pickled", but the finish on the cabinets was so scuffed and worn that it showed EVERY ding and dent instead of enhancing them. I was bummed, because I was hoping that the "white wash" would be a relatively easy fix. But no, it didn't work because of the poor condition of the cabinet finish. Here's the bar area today, with 2 coats of the new paint. Sorry for the mess, this is some "real life" progress pics of the painting. So as Hubbs and I sat contemplating the situation we agreed a paint finish was needed. If I would have had to make this decision a month ago I would have been overwhelmed, but now, with almost every thing else done, I could approach the project with some sense of calm and common sense. 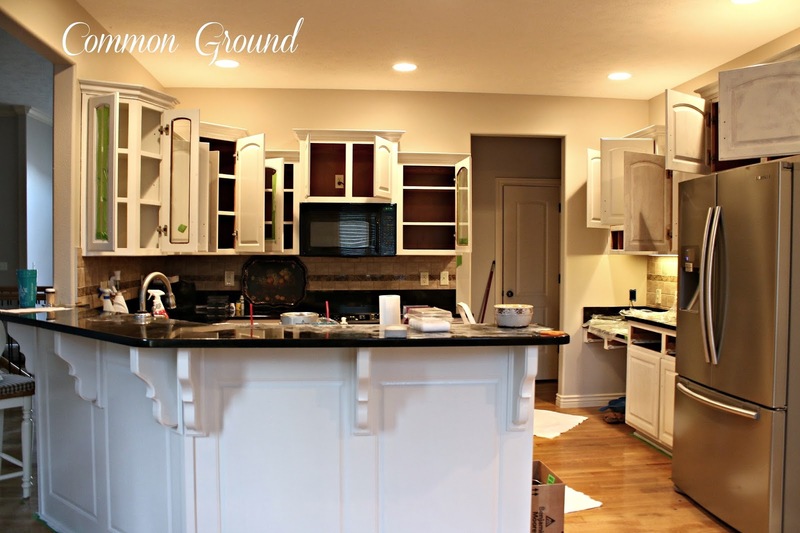 Painting the kitchen cabinets at the old house was a monumental task, and not an easy one. My paint choice was less that perfect so I had headaches with it from the get-go. Runs, drips, build up...I had to re-sand and go at it again. I didn't want to repeat that scenario. So, I headed to my trusty Benjamin Moore peeps and they told me what and how to use their new cabinet paint, Advance. It's a thinner paint that requires no sanding or primer...I know, I know, but it's that good, and I've kept the doors up, and just sanded down the bad parts of the previous finish. I'm only painting the interior of the three cabinets with glass doors. 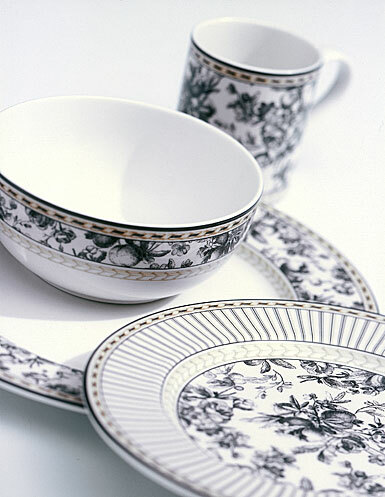 I will put my everyday china, Studio Provence Noir by Royal Doulton and some ironstone in those, the other will hold some of my glassware and crystal. * This is now 4 years later, and we are undertaking a renovation of a "new to us" home built in the 60's. We are researching paint again, so I've gone back to Benjamin Moore for advice and paint. 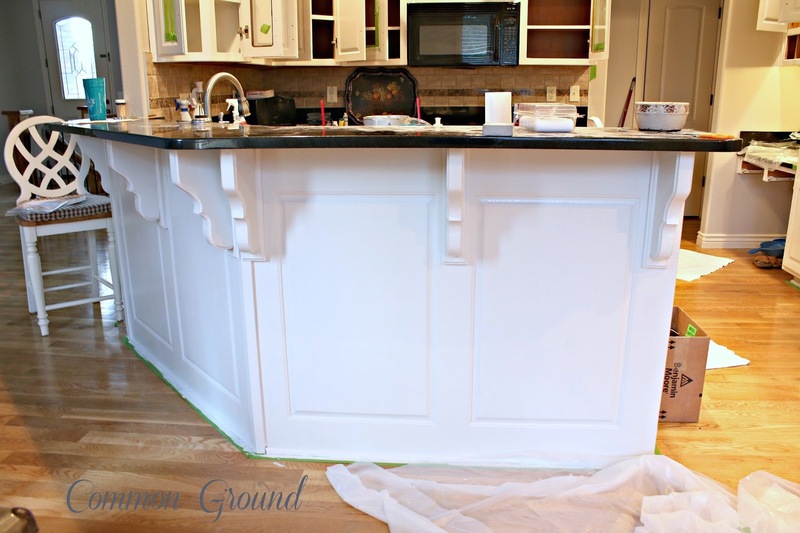 The protocol now for painting cabinets is to use a coat of pre-tinted Primer before you use the Advance paint. I've had a few chips, but nothing much. I would have used Primer if the company had been advising that. Live and Learn. Just wanted to let you all know of the protocol change. Oh, and let me tell you about a new product I've found for clean-up...Krud Kutter. Some of you might be familiar with it, but I used this instead of TSP for prepping the cabinet surfaces. Took off all the junk that collects on wood cabinets and didn't leave any residue. Advance is an Alkyd which is a cross between the durability of an oil based enamel and the soap/water cleanup of a latex. It dries harder, so a little more difficult to clean up brushes, but the difference between this and regular paint is night and day. I've put on thin coats with a brush and foam roller and I've had almost no drips or problems. You have to wait 16 hours before recoating, but for us it's not a problem, since we're not living at the house yet. It takes about 5 or 6 days to fully cure, but then they said it would have a super hard finish. 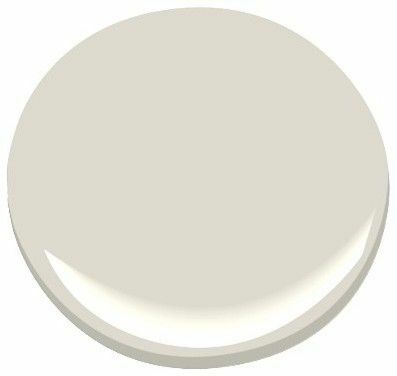 I had originally chosen China White by Ben Moore for the cabinet color, but even though it had gray and taupe undertones, it was still too light. I ended up with Pale Oak by Benjamin Moore, here is the sample. 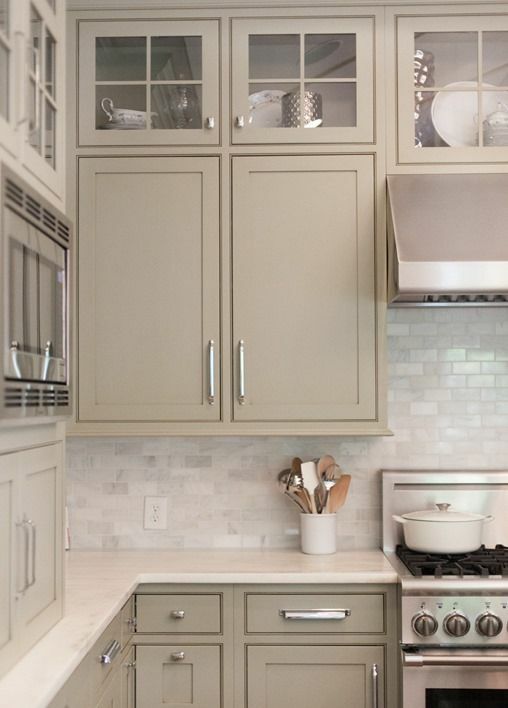 It's hard to see on the cabinets, but it's just a nice neutral "griege" that still gives the effect of an off white. We had to consider the wall color and woodwork color when we made this decision, since you can also see it all from the Living Room. You can tell from this photo that the oak color was too orange and the black granite made it really dark in the prep area. It's not a very large space, but now it's so much lighter and brighter. but not enough to make it work. Here are some kitchen inspiration photos from my Pinterest Board, New House Kitchen Inspiration. 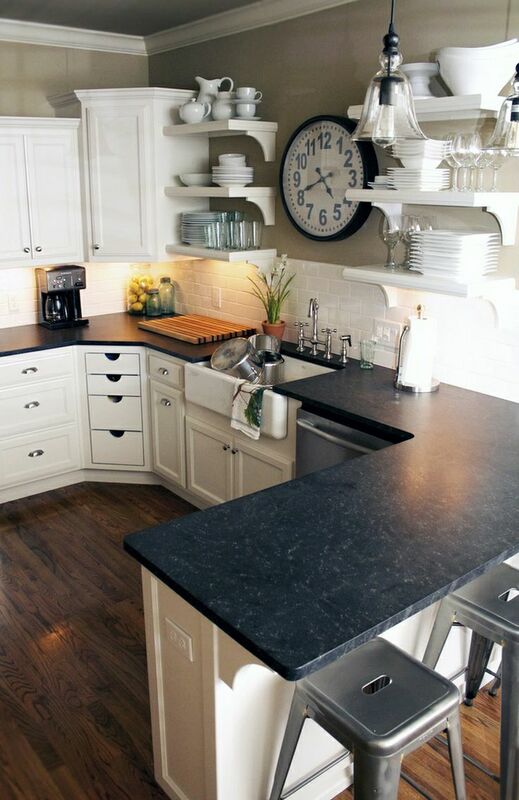 I have focused on light gray or beige cabinets and some with the black granite. I'd love to have subway tile on my backsplash, but that probably can wait. I still have more work to do. You could tell by the photos I still have another couple of thin rolled coats to do, but I'm really pleased with the progress. I'm taking my time, and being vigilant with the process, keeping an eagle eye out for anything that even slightly looks like a drip. Hubbs and Aly have been helping, so I don't feel like I'm doing it all by myself. You have to be psyched up for a job like this. 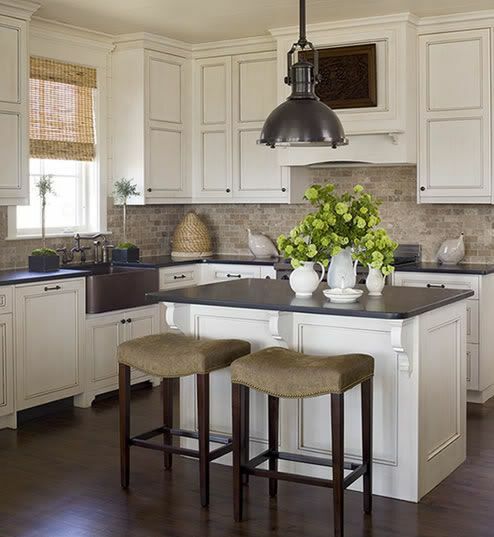 I'll be looking for new cabinet and drawer pulls in a pewter finish, then I have to find a couple of bar stools, as my other chairs are "counter" height and take up too much space. They are going to look fabulous! They look great...can't wait to see it all done!! Debra, what a wonderful post! 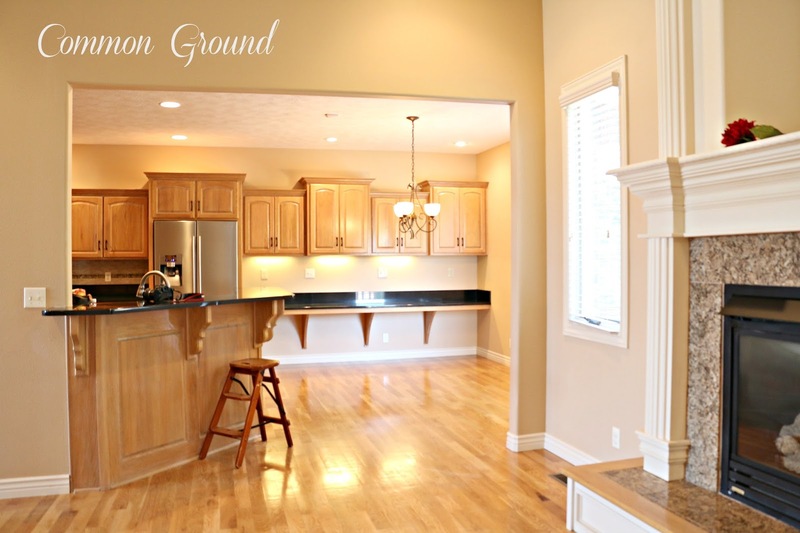 I love your kitchen and the new color you chose! Thanks so much for the fabulous info! I'll be looking for these products for sure! ha ha, yep, I'm trying to see if I can't cover up a little of that granite stripe in the backsplash! I have a black tole tray obsession! I didn't realize that you hadn't moved in yet. I'm sure you'll be in by the holidays. I can't wait to see it all decorated in your style! Hi Brenda, I'm hoping we're in by the end of the month, I want to enjoy a little "Fall" there! Oh this is absolutely awesome. I am SO SO EXCITED for you, Debra! One of these days I may tackle my cupboards - you are an inspiration, what a huge bit of work, yikes! I made a note of that paid - good to know, thank you. Thank you for sharing this! I didn't know about this paint. I love my cabinet color, but after a decade they are looking a bit dingy. Your post is what I needed to give me inspiration to tackle it. (I pinned it).I will look forward to seeing your final reveal. I'm impressed. 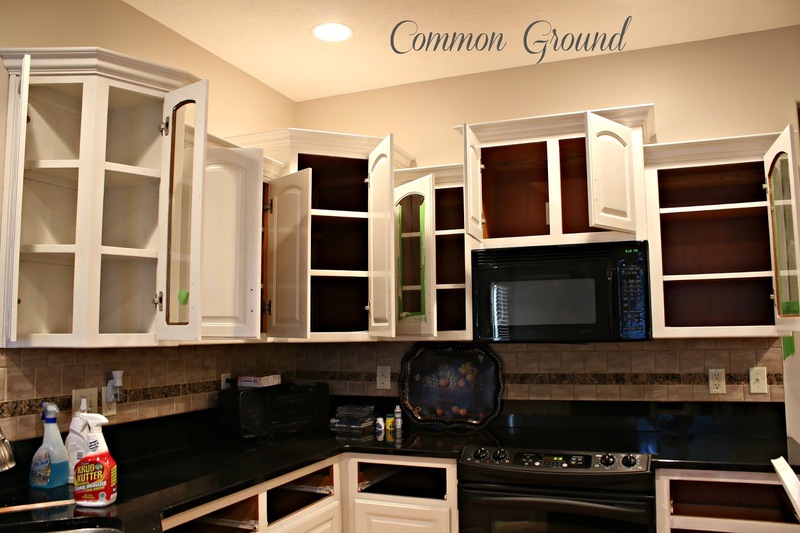 I've been thinking about refinishing my cabinets myself, but it seems way too monumental as I have a full time job and kids. I think I may just have to bite the bullet and pay someone. What an amazing transformation! A lot of hard work but so worth it! Beautiful job. Congrats on a new stunning kitchen. 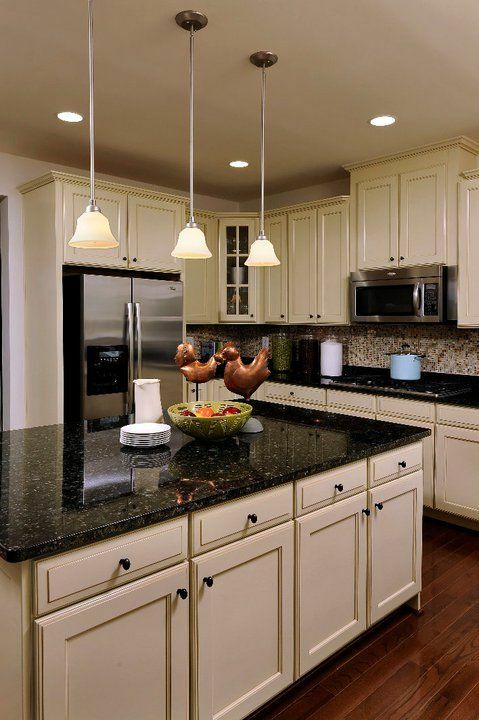 the lighter cabinets really make the counters pop! Thanks for the tip on the new paint. About time a paint company addressed the fact that folks like to paint cabinets and need an easier solution to application. What a beautiful transformation! All of you are doing an awesome job!! They are going to be so pretty, Debra! I'm really liking the new griege colors that are out-pacing white as the new cabinet color choice. 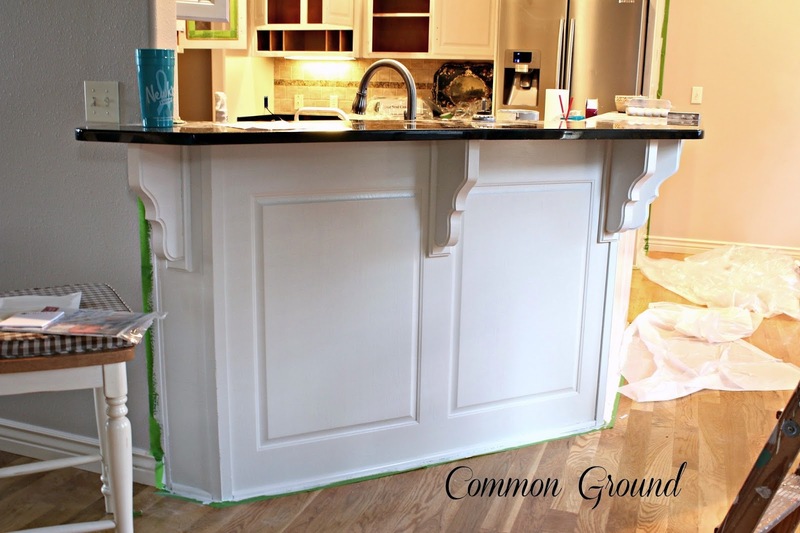 Love, LOVE, L O V E the transformation taking place in your kitchen, dear friend!!! "The Kitchen is the Heart of the Home". . .
and one area I, truly, feel needs to be personalized! Thank you for sharing these products of paint and cleansers. Arriving home from our Annual Trout Fishing Trip. . .
tonight, "Mr. Ed" & I were both looking at the kitchen cabinets. My response. . .wait 'til after our Bits 'n Pieces booth! Thank you for sharing the kitchen work in progress!!! How exciting! It's all looking wonderful! I need some of that Krud Cutter! Thanks for the tip. So glad it's all coming together for you! It's looking great! It was fun to see the befores and then the pickling, which wasn't bad, and now to see how bright and fresh it's gonna look all painted. 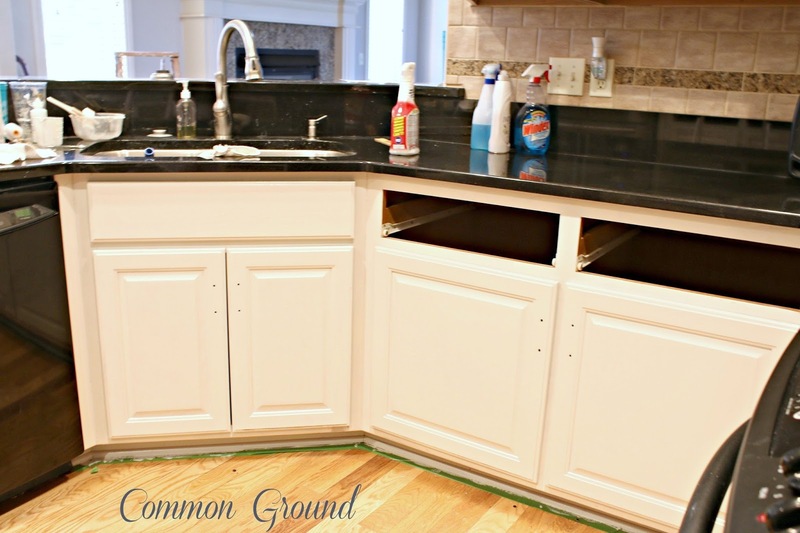 Thanks for sharing about the cabinet paint, and krud kutter, those are great things to know! I thought you were living there already... Will it be soon ? Looking good! I'm considering painting my bathroom cabinets and you've shared some great tips. It's going to be beautiful, Debra! I know from experience what a big job it is...glad you are taking your time!